Match organisers often have a lot to think about to ensure everything runs smoothly on matchday. I did it for well over 25 years, but in all that time I never forgot to put my tackle in the back of the car. So spare a thought for Alan Marshall. He runs the Float Fish Farm open matches and should be congratulated for doing a fine job. But he certainly had a red face on Saturday - either through embarrassment or anger - as he opened his van door after the draw to discover he’d forgotten his tackle. Thankfully they are a good bunch down at Float Fish Farm and everyone rallied round to lend him gear and bait so that he was fully functioning with no restrictions at all to his fishing. Mind you he was still deeply embarrassed. The match itself was split between Wagtail and Horseshoe and the fishing was hard for most. However, there were still plenty of fish caught and the top three all did well. Leading the way was Peter Telzewski. He drew hot peg 11 on Wagtail and caught on the feeder with pellet for 72lb 12oz. Runner-up on Horseshoe was Shaun Waterfall, who caught 60lb 4oz, then came Roy Wells with 48lb 7oz. JVAC rod Andy Gausden decided to run an impromptu open match at Decoy which was a well attended match spread over the Elm and Cedar Pools and saw some good weights taken, especially from Cedar. Ian Frith topped this one with 57lb 13oz from peg eight catching on the pole with soft pellet. Runner-up with a level 56lb was Ernie Lowbridge, followed by Mike Mitchell with 35lb 13oz. Over on Elm it was tough going after the early morning frost. 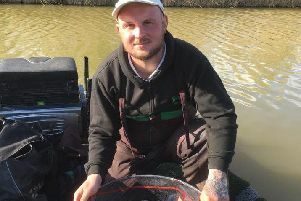 Dan Abbott took the honours with 31lb 14oz on the pole and pellet approach from peg six. Dave Rowell was second on 28lb 6oz then it was Andy Gausden on 27lb 15oz. On Monday, JVAC held another match and a big turnout covered both Four and Six Islands at Decoy. Frith rounded off a fine run of results over the holiday period with yet another win, topping Six Islands with 67lb 8oz from peg four fishing soft pellet on a long pole line. Second was Ernie Lowbridge, who fished red maggot for 48lb 10oz. Pete Molesworth put 46lb 12oz to the scales from peg four on Four Islands, just enough for first place ahead of Chris Saunders on 41lb 2oz.